This work was installed with the help of Dave Mitchell and Murray Adams in early October last year. It was a real pleasure to make, and a real treat to finally have a reason to engrave images onto acrylic sheet. Gene Garden from Corangamite CMA helped me to come up with the short list of creatures to illustrate. They include the River Black Fish, the rare Grayling, Southern Pigmey Perch, a Fat Tailed Dunnart & a Tree Fern, a Spotted Quoll (possibly my new favourite animal) & a Beech Myrtle, a Platypus, an Otway-Yarra Spiny Yabby (an exquisite creature), a Sugar Glider, a Small Burrowing Crayfish and a beautiful Royal Spoonbill. Each of these beings depend of the Gellibrand River ecosystem in the Western Otway Ranges, the same river system that provides water for the townships of Warrnambool and Colac. Now when my kids take too long in the shower I don’t just tell them that they are wasting the water, I tell them that they are wasting the river- it has immediate effects. I replied to the EOI put out by Heytesbury Landcare in June because I found it’s goal of increasing understanding of where our water comes from fitted with work I had been doing in my own art practice. In 2012 I began a Visual Art PhD that concentrated on the connection between the individual and the environment. I spent the first year of my research looking at the landscape around here and around my childhood home in Murray river and Hume Weir country near Albury-Wodonga. I considered ideas about nature, I looked at the ways we have shaped the landscape and how it shapes us. I spent the second year looking solely at my domestic home, looking at the different habits, interactions and activities that we do to create the dependable routines that produce the stability and security that we generally feel within our homes. Whilst at first glance it may appear that these two areas of research, the landscape and the domestic home, describe separate spaces, what I actually found was the extent to which these spaces are utterly intertwined, and it was the very simple, very ordinary material of water that gave me the key. I had drawn a picture of my bathroom basin with water running from its tap and a wave breaking out over the side of the basin- I had drawn the tap water clear and drawn the wave using the colours that we would expect to find out here in the southern ocean. This simple difference gave away underlying distinctions that I had made between my domestic home and the so-called natural world. I realized that this was a question that many of us here in Warrnambool should consider more carefully, many of us do not even realise that the Gellibrand flows into our homes. My sculpture, which I have called “The Water Tower” makes reference to the humble domestic shower. Etched into each of the acrylic panels you will find just a handful of the many other species who make their homes in the Gellibrand and its catchment area. Despite the top paddles looking as though they should move, they do not, in fact there is only one part of the sculpture that does move- the hot & cold taps on either side of the central panel. When you look at the creatures etched and get that warm little feeling & awe at nature’s beauty this sculpture asks you to consider the primary that way that you already interact with those creatures- and that you please, bare them in mind you use the hot and cold taps in your own home. I took a fortnight off from my PhD at the end of June to complete some work for a children’s festival here in Warrnambool. It’s Australia’s largest kids festival and runs for eight days, Fun 4 Kids. This project was a great way to test out program design and installation approaches. I designed the space as a children’s craft space that would only use paper based products- no pipe cleaners or lil’ foam balls in sight!! Using this combination of coloured paper and reclaimed cardboard children were able to make an array of creatures including mini beasts and “day tree creatures”. Children were invited to help us populate the tree over and over the course of each day a unique and colourful ecosystem would appear- this was so much fun! The craft programs were easy to adapt to different abilities and ages. One of the most beautiful things for me to watch was the way these craft activities worked to generate some great interactions between parents and children. It really was satisfying to watch. The CreaTree is a sculptural tree designed to have a curtain sandwiched between it to create two spaces: the well lit Day Tree space and the Dream Tree Space, a dark space with UV Light. I constructed the tree using 17mm Ply Board and I have described it as “Becky’s version if Ikea”- it all flat packs down so it can fit into the back of our 4WD. The tree blots into a heavy steal base which I had made locally. The rest of the tree slots together using dowel joints- I am pretty proud of this sculpture, I worked my toshie off on it and it is quite beautiful. The black plastic in these photos is awful! I have made a really nice, deep blue curtain ready for the CreaTree’s next incarnation- the CreaTree concept lends itself to adaptable programing and I am looking forward to the next series! In late December 2013 I was able to make a research trip to Sydney. My aim was to see two spaces that I had viewed from a far for too long- Edge of Trees and Paddington Reservoir Gardens. I also took advantage of my temporary location by visiting a few other art sites. 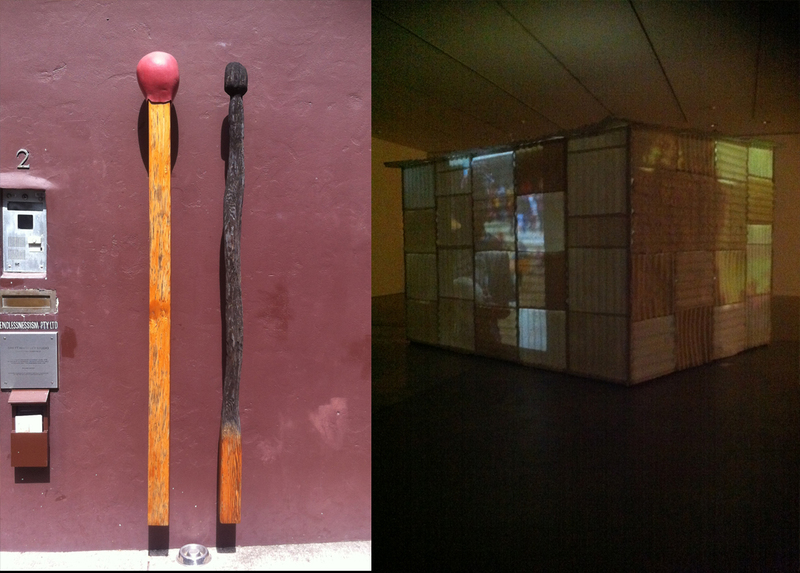 I visited the amazing collection of contemporary Chinese art at White Rabbit Gallery in Central Sydney http://www.whiterabbitcollection.org/ , I was impressed by the way many of the works really grappled with the social, political and spiritual turbulence spurred by globalisation’s rapid pace. Gonkar Gyasto is the artist who has most stayed with me- his works deals with place and placelessness and identity. After lunch I made the trek to Brett Whitley’s Studio in Surry Hills, http://www.artgallery.nsw.gov.au/brett-whiteley-studio/ where I spent time with epic self-portrait as a landscape, Alchemy. I had seen this work on an ABC Documentary http://www.abc.net.au/arts/artofaustralia/ and felt that Whiteley’s process of making an immense landscape as self-portrait and autobiographical narrative illustrated my notion of aesthetic subjectivity perfectly. I crawled over this painting for almost an hour. Walking back into Sydney Central I made my way to the Art Gallery of NSW. Here I was most keen to see the work Illuminate. The product of a community arts collaboration between paper makers and Euraba artists from Northern NSW. I found this work mesmerizing. A corrugated box hut made of paper and illuminated from the inside out by four video projectors which animate each of the four walls with documentary style footage- it became this glowing aesthetic object, what you imagine the intersection between memory and place, our memory and home may be. On my second day I sought out Fiona Foley’s and Janet Laurence’s Edge of Trees and the Museum of Sydney Forecourt. I first saw this work on a documentary about Laurence on the ABC (God bless aunty) back in 2007 I think. At the time I was really impressed by her approached and just really “got it”. In this work trees originally felled from the area (that had taken seed pre-colonisation) were returned to the site as greyed, noble logs. Laurence and Foley have used a number of materials to convey and capture the memory of this site, Latin and indigenous names are inscribed on the poles and heard echoing through this relic site. This was one of those sites which visiting only enhanced my appreciation of it, I felt it as a really powerful memorial and as a place in which to come to terms with history. Sitting there on a Sunday morning with the noises of buses, cars and pedestrians I imagined what it would feel like in the quiet of 3am, in the dark would the speaker’s aboriginal voice echo in the urban still? I took a punt and figured out how to use Sydney public transport just enough to get myself to Paddington. I bought myself a coffee, crossed the road and walked down the stairs into the Paddington Reservoir Gardens. A young lady sat taking flute lessons, a family picnicked on a section of grass. I looked around the space, beautiful- what I had expected, an eclectic intersection of ruins and landscape gardening that embodied that contemporary eco-aesthetic. But I was a little underwhelmed too, and that is not a bad thing, I really had to query why I was underwhelmed. My research has led me to look at our relationship to the environment and this has in turn revealed the many ways in which this relationship is constructed. This construction process is not always one in which we can exert our own agency however, it is not uncommon for the constructed spaces in which we find ourselves to be forces themselves in fact shaping our agency. I had stayed in Western Sydney and caught the train to and from that infamous urban landscape. Making my way into the Sydney CBD that morning it was impossible to ignore the way money concentrates itself as witnessed in the buildings of the area, their commercial occupants and their proximity to the harbor, the memory of that Edge of Trees nestled into this Western, globalized space. Sitting here in Paddington it was hard to detach from the awareness that this beautiful, ethical space was entwined in the circumstances of privilege that keep its nearby property prices so high. Another dimension to my underwhelming was to do with the difference between a space made using aesthetics to create a more neutral common area and a space made using aesthetics as a language to engage its visitors and its socio-historical contexts in order to push into a questioning of that relationship between subject and world.